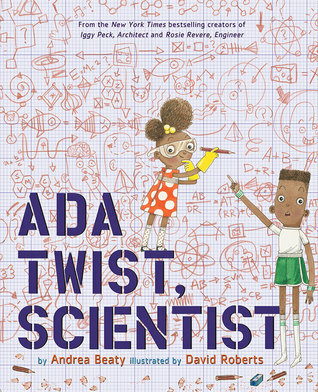 Ada Twist, Scientist by Andrea Beaty, illustrated by David Roberts, is a delightful story of a young girl bubbling over with so many questions and problems to solve. She reminds me so much of my daughter and her endless questions about why things are and how they became. Many kids inquire, but like Ada, they need to be encouraged to explore, to experiment, to create, and to discover. Ada is a strong girl who is not afraid of failure, with each mishap she begins again, returning to her same questions and moving forward with each new piece of information she learns. Her parents and teachers have no idea what to do with her inquiring mind, and even when they put her in the “thinking” chair, it’s hard for Ada to stop her exploring and wondering. My daughter and I are just beginning her exploring from rock discovery kits to scientific explosions and creating slime. 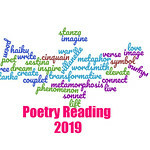 It’s wonderful to share with her the knowledge I learned and to see how she uncovers the connections and has fun doing so. The poetry in Beaty’s book is fantastic, if a little awkward in some places. But overall, children will get the bug — the discovery bug — and want to find out for themselves how the world operates and what is going on around them. Ada Twist, Scientist by Andrea Beaty, illustrated by David Roberts, is delightful, and my daughter and I cannot wait to check out the other kids books she has about kids dreaming big, doing great things, and having fun too. Andrea Beaty was raised in southern Illinois in a town so small she knew everybody and their pets. And they all knew her. She was one of six kids and spent our summer days traipsing through the fields and forests hunting for adventure. She was a big reader as a kid and LOVED Nancy Drew and Trixie Beldon Mysteries. Then Andrea moved on to Agatha Christie books and then the classics. She attended Southern Illinois University and studied Biology and Computer Science. After that, she worked for a computer software company. Now, she lives in Chicago with her family. Visit her website. Follow her on Twitter and Pinterest. Also, check out David Roberts’ illustrations online. This sounds like a wonderful book for curious young people. Excellent review! I think this is great for all young girls and boys. This sounds great! Glad you enjoyed it. What a great way to encourage an inquisitive mind. This sounds fabulous!